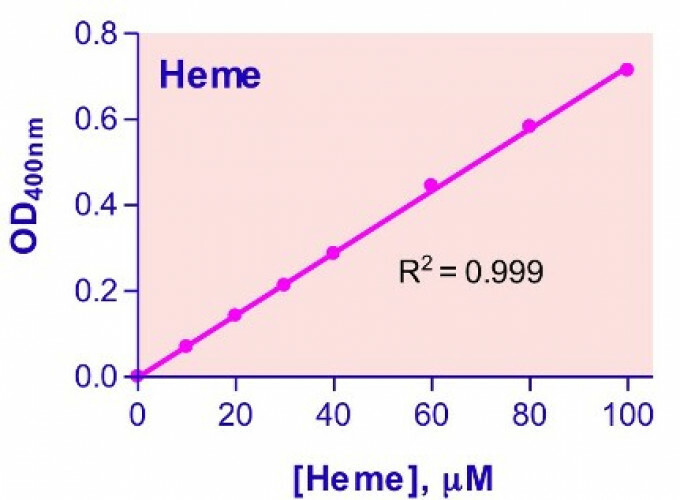 For quantitative determination of heme and evaluation of drug effects on heme metabolism. • Sensitive and accurate. 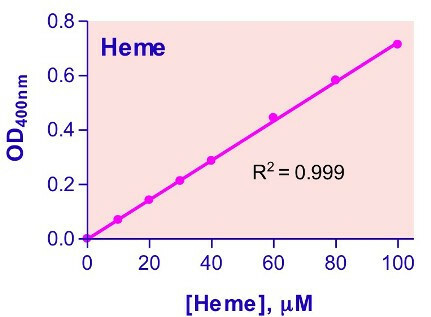 Linear detection range 0.6 - 125 μM heme in 96-well plate assay. • Simple and high-throughput. The "mix-and-read" procedure involves addition of a single working reagent and reading the optical density. Can be readily automated as a high-throughput assay in 96-well plates for thousands of samples per day. • Safety. Reagents are non-toxic. Heme is one important member of the porphyrin family. It is synthesized in both mitochondria and cytoplasm, and is a key prosthetic group for various essential proteins such as hemoglobin, cytochromes, catalases and peroxidases. Heme determination is widely practiced by researchers of various blood diseases. Simple, direct and automation-ready procedures for measuring heme concentration are becoming popular in Research and Drug Discovery. BioAssay Systems’ QuantiChrom™ Heme Assay Kit is based on an improved aqueous alkaline solution method, in which the heme is converted into a uniform colored form. The intensity of color, measured at 400 nm, is directly proportional to the heme concentration in the sample. The optimized formulation substantially reduces interference by substances in the raw samples and exhibits high sensitivity. Applications For quantitative determination of heme and evaluation of drug effects on heme metabolism. References Assay: Heme in Mouse tissue (Pubmed). 2. Aldag C et al (2009). Probing the role of the proximal heme ligand in cytochrome P450cam by recombinant incorporation of selenocysteine. PNAS 106(14):5481-6. Assay: Heme in Bacteria p450 enzymes (Pubmed). 3. Huang ML et al (2009). Elucidation of the mechanism of mitochondrial iron loading in Friedreich’s ataxia by analysis of a mouse mutant. PNAS 106(38):16381-6. Assay: Heme in Mouse heart (Pubmed). 4. Ndisang JF et al (2010). Up-regulating the heme oxygenase system with hemin improves insulin sensitivity and glucose metabolism in adult spontaneously hypertensive rats. Endocrinology 151(2):549-60. Assay: Heme in Rat plasma (Pubmed). 5. Zwart SR et al (2009). Body iron stores and oxidative damage in humans increased during and after a 10- to 12-day undersea dive. J Nutr. 139(1):90-5. Assay: Heme in Human plasma (Pubmed). 6. Ndisang JF, Jadhav A (2010). The heme oxygenase system attenuates pancreatic lesions and improves insulin sensitivity and glucose metabolism in deoxycorticosterone acetate hypertension. Am J Physiol Regul Integr Comp Physiol. 298(1):R211-23. Assay: Heme in Rat tissue (Pubmed). 1. Pamplona, A. et al (2007). Heme oxygenase-1 and carbon monoxide suppress the pathogenesis of experimental cerebral malaria. Nature Med. 13(6): 703-710. Assay: Heme in Mouse tissue (Pubmed).